Advanced articles about James Lawley and Penny Tompkins' process: Symbolic Modelling. A joined-up model of how methodologies derived from the work of David Grove invoke the psychoactivity of spatial relations in therapeutic, as well as in other settings. Once a space becomes psychoactive a person is effectively 'living in their metaphor'. Then, when something changes in that perceptual space (often spontaneously), more of their mind-body is involved. This usually produces a more embodied and systemic change. An interview with Penny Tompkins and James Lawley by John Soderlund, editor New Therapist. Published in Positive Health in 2002, we explain why metaphor is a natural way to describe illness and health, the importance of recognising patient/client metaphors, and how working within these metaphors can activate an individual's personal healing process. This article describes a model for a way of thinking during those few seconds when you are pondering what the client has just said. It describes a way of modelling-in-the-moment; a way to ensure that what you decide to say is maximally informed by the client's information. Part 1 explained that underlying every theory of management or organisation is a metaphor. It described eight commonly used metaphors and Gareth Morgan's method for analysing and facilitating organisations to change. Part 2 shows how Symbolic Modelling uses client-generated metaphors to facilitate individuals to understand and change themselves and their organisations. Although there is only 'now', we get seduced by the idea/metaphor that there are other times. We talk about the past and future as if they exist rather than being figments of our momentary imagination. As clean facilitators we retain the knowledge that whatever the client is saying or doing, neurologically and physiologically it's happening now. 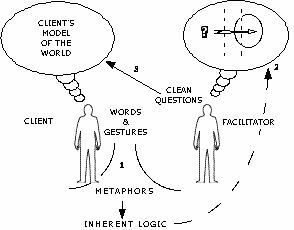 We also assume that the client’s behaviour is always embodying their current model of the world but they are often unaware of it. When we 'go live' we are inviting the client to attend to that model, metaphor or behaviour, in-the-moment, as it happens. In this way the client becomes aware of, and stays close to what is happening for them 'right here, right now'. Desired outcomes, aims, goals, intentions, objectives, plans, purposes and targets all describe a preferred future. When in the future and what kind of outcome makes a difference to how we facilitate clients to realise their desires. Whether a person wants to take a decision in the here and now, or to enjoy the rest of their life, involves different timeframes and structurally different outcomes. This paper examines modelling the timeframes, structures and evidence of client’s desires.